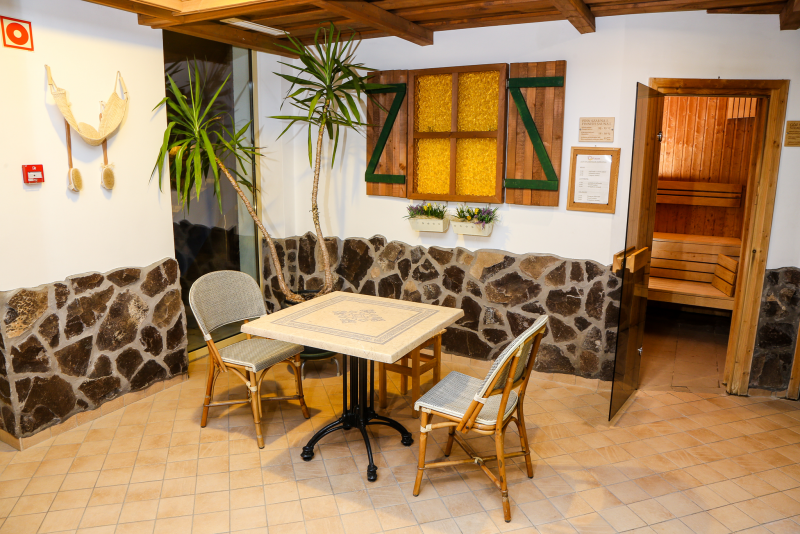 At the Calimbra Hotel Wellness there are 2 Finnish saunas, 1 infrasauna and 1 steam sauna available to our Guests. Sauna séances organised by sauna experts (with essential oils, citrous, with brandy-ice, beer scents) on Tuesdays, Thursdays and Sundays, two times a day. What to expect during the séances? The Sauna Séance® evokes the “spirit” of a good atmosphere and well-being, at the dry and steam sauna. During each Sauna Séance®, the sauna expert is in the sauna with the guests, to gradually heat the cabin by aromatic fill-ups applied to the heater, thus providing for the acclimatisation of our Guests. The sauna expert aims to provide personal ventilation, by stirring the hot air with the help of a sauna flag and towel. In addition thereto, the sauna expert tries to answer all questions related to the sauna experience, and he/she also supervises the sauna section and controls that each guest complies with the rules of the proper and hygienic use of the sauna. The Sauna Séances® are also different from the traditional use of the sauna in that thanks to the sauna expert, there is cheerful conversation ongoing at the Sauna Séance® events. The consecutive programmes are more and more “powerful”. Each programme lasts max. 12-15 minutes, but anyone who feels that they would like to end their stay in the sauna can just leave anytime. This is followed by cooling off, and the relaxation. One of the objectives of the sauna experts at the Séances is for the guests to have chills run down their spines. This is a very special, good feeling, and provides great help in the first place with stress relief, as a result of the enhanced generation of the endorphin hormone, experienced when we get goose bumps. The séances are always held within the framework of specific programmes. Each programme has its own unique magic. Please refer to a more detailed description of those under the Brief Séance Information chapter. The Sauna Séances® are real social programmes, irrespective of whether you have arrived on your own or in company of others. Upon the initiative of the sauna expert, guests have pleasant conversations and some jokes are also told most of the time. If the sauna expert thinks that his/her guests prefer tranquillity and quiet, then a more relaxed and more quiet Sauna Séance® will be held. We do not recommend this programme to those who wish to be all alone! The sauna expert spreads 100% pure essential oil mixed in water over the heater. The aromatic hot air has a beneficial effect on the psyche, and is perfect to treat and prevent respiratory diseases. Séances can be varied with the help of different aromas. We use this programme as a “warm-up” in the first place, still, it is more intensive than the traditional form of using a sauna. Use of the sauna with aromas helps with improving your mood, in addition to the excellent stress-relief effect of the sauna. Similar to the aroma séance, the sauna expert spreads 100% pure citrous essential oil mixed in water over the heater. The sauna expert provides circulation of hot air of a nice scent to those enjoying the sauna experience. At the end of the ceremony, cooled slices of fruit are offered to our Guests, which is both very refreshing and a real “vitamin treat”. Vitamins and other mineral substances are absorbed much more intensively after the sauna experience. It is one of the popular programmes. By applying brandy-ice to the heater, excellent heat can be generated in the cabin. It is very spectacular, and also the play with the ice pieces provided is refreshing. It is an exhilarating feeling to see the sauna expert play with the hot air, and chills are running down the spine of the guests. At the end of the séance, participants will also receive a throw of ice-water down their back. This is where the real intensive sauna experience can be felt. It is very popular with men, however, the nice scent of beer is mixed with the sauna’s hot air and it is not consumed. The sauna expert pours water mixed with beer onto the sauna stove, so a pleasant scent of malt and barley will appear in the sauna cabin, while there is heat provided to our Guests by hot air, similar to “desert wind”. Through the beer steam, the vitamin B in beer is easily absorbed through the enlarged pores. COME AND BE PART OF THE SÉANCE EXPERIENCE!